Dwr Y Felin Log Cabins07515 433787work Self-cateringTy Afal, Ty Ceirios and Ty Peren are hand crafted traditional Estonian log houses, designed and furnished to a high standard, and sleep 2-6 guests. 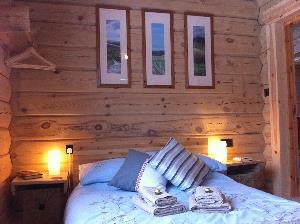 These three self catering log cabins are set in their own secluded spot on our working family farm. Each cabin boasts it's own private hot tub on the patio where star gazing is a must, no light pollution to be found here. Eco features include ground source heating, solar panels, plus a clean water filter drainage system. Recycling of paper, plastics and glass on site is part of our eco credentials. Three bedrooms and three shower rooms in each cabin along with a stylish kitchen, open plan dining area and lounge, make these cabins an ideal place for that romantic break, long awaited family reunion or relaxed family holiday, also great for a weekend away with friends. Ty Peren is also ideally suited as a honeymoon destination. The balcony lends itself well to a breakfast of coffee and croissants with glorious views all around. Quality bedlinen made up on all beds ready for your arrival, plus bath and hand towels supplied. Please bring your own towels for hot tub and beach use. Cots and high chairs are available at £10 per item per week. We do not cater for pets in any of our Log Cabins. Dwr y Felin offer a special two night weekend break for two adults wishing to escape the hustle and bustle of every day life. Whether it's an anniversary, honeymoon, proposal, birthday or pre baby break, the log cabin will provide you both with a sense of tranquillity and romance. The private hot tub is a great place to gaze up at the stars. The log cabins are situated on a part of the family farm with sheep and cattle grazing alongside the fence. Eco friendly features include ground source heating, solar panels, own water source and own waste water treatment plant. Recycling is also encouraged. The outdoor fire pit by the lake is ideal for toasting marshmallows under the stars, or watching the dragonflies dance. A short stroll from your cabin takes you down to Kingfisher pond where there is a camp fire for toasting marshmallows under the stars, and a bench for outdoor eating. Ample car parking by each cabin for 2 vehicles. A five minute walk takes you down to Carno village where there is a Spar shop selling locally sourced produce and a pub which serves home cooked meals daily. Ty Afal, Ty Ceirios and Ty Peren are hand crafted traditional Estonian log houses, designed and furnished to a high standard, and sleep 2-6 guests. There are many activities locally ie golf, fishing, sailing, quad biking, mountain biking, walking to name but a few. The glorious beaches of mid wales are only a 30 minute drive from Carno and there are numerous welsh market towns to explore. Private Hot Tub Balcony Outside fire pit by lake with jetty Area provided for disposable BBQ use by each log cabin Children welcome from any age. Car recommended to Dwr Y Felin Log Cabins. Train station 4 km away. We are able to collect guests from station. Regular bus service from Carno to Newtown, Llanidloes and Machynlleth. all wooden floors are soft, and mark easily.